1. the bonds - when we are at our most vulnerable we open up, and we bond. the back-country has a way of whittling us down to basic needs: food, water, sleep, surviving danger, peace. we tend to bond with those we are with, particularly through more "epic" times of risk or hardship. it is a particularly special thing to share that with your children. to see them overcome, to trust you completely, to encourage you creates unforgettable bonds and memories. recently my two boys did their first 3AII PG canyon. whilst in the canyon, I occasionally had to act as a human chokestone with my kids downclimbing to me, and then spotting one another below me (literally giving one another a hand.) the most meaningful part of the day was a long section where I had to stem high with a gear bag, while my boys walked below. my eldest, seeing how exhausted I became, scrambled up some rocks where the canyon started to widen, so he was level with me. from there he shouted encouragements to me, and once I was close enough, he came and took the bag so I could do the last bit of stemming without the added weight. a full circle drawn - my 10 year old helped me through a physically demanding and spooky part of a canyon. lows are 0's and highs are 10, so keep perspective: I was told that with kids, your lows outdoors are 0s, and before they were only 2s. it's one thing to be out of food, water, and be miserable...and it's another to watch your child be miserable. particularly memorable for me is a day climbing in indian creek, when one toddler got diarrhea (pack it in pack it out - guess who held little doggie bags all day?) and the other toddler peed on the bag of food for the day. 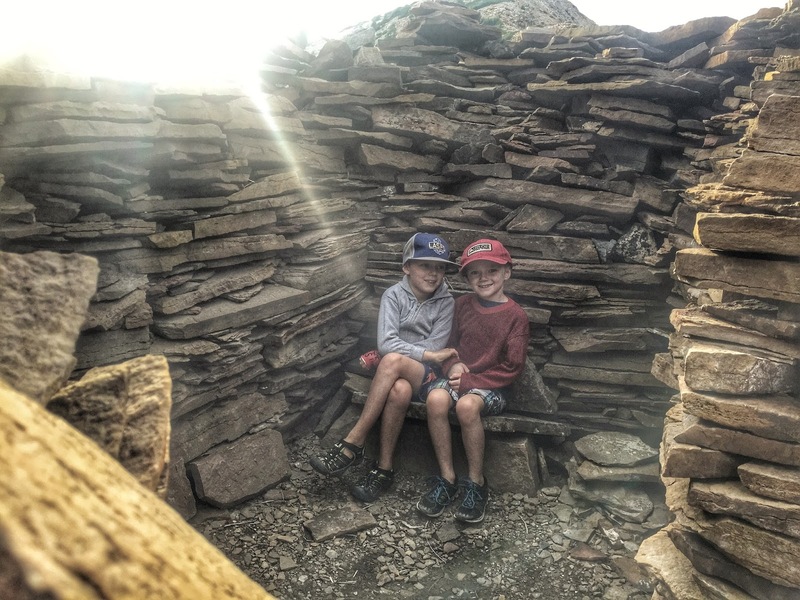 the highs are 10s though - whatever exhilaration you feel running to the top of a mountain or exploring a new canyon - it doesn't compare to the feeling of doing that same exact thing with your child, with them on the same high you're on. watching my son run as hard as he could up the summit of a 12,000 ft peak in the Tushars in the rain, pushing his limits, and witnessing his sense of accomplishment, is far more rewarding than performing well in a race. asses the risks, know their limits: when you take kids into the wilderness, you are making the risk assessments for everyone involved. they aren't going to know if they're skiing in avalanche terrain, if the anchor is sketchy, if storms are brewing. hopefully we can teach them these things, but you as their parent are the primary resource for their risk assessments. also, help them to do activities within their physical abilities. don't drag them up a mountain that's 4000 ft vertical gain and 14 miles round trip if they haven't been physically active, or don't try to have them ski or climb something way out of their ability levels. have them workout with you, hike or bike, and build a bit of a base fitness so that when they do more physically demanding things their little legs are at least a little bit used to it. I also always bring extra - extra headlamps, water, snacks, more snacks, and more snacks and layers for kids. "well, we did Mt Nebo so this can't be that hard, right Mom?" What a wonderful blog. Thank you! What a superb blog. Much obliged to you! Travelling is great but it gets more cool when you have kids around you. Really liked to read this post. This was indeed a great one.